For all sorts of printing needs, the Lexmark P-4330 excels. In the long run your Lexmark P4330 will gobble up all of your printer ink, and when that does happen you'll soon find that new Lexmark P4330 ink may be quite costly. But you don't have to get worried about forking out the steep purchase prices you'll uncover on the main street because right here at Cartridge Save you can buy all the Lexmark P 4330 cartridges you want at super competitive prices. Start to save money on your ink by ordering online with the UK's top performing printer cartridge retailer, Cartridge Save! Why pay high prices for a P-4330 original cartridge or P4330 compatible ink in the high street when it is much easier to save a handful of cash shopping with Cartridge Save. You have one hundred per cent confidence when you order your Photo Inkjet P4330 ink cartridges from us as everything is guaranteed by a quibble-free money back guarantee. Don't forget that every order also comes with free delivery, most likely delivered to your doorstep on the following day! The Lexmark P4330 multifunction printer comes with colour scanning and copying for more convenience in small working environments. With a simple design and lightweight frame, the Lexmark P4330 is an excellent all-in-one device for a home office, too, but has been discontinued by the company. Meanwhile, users are not happy with the pricey running costs and the sub-par copy speeds. The P4330 inkjet printer has an understated appearance with a flatbed scanner on top, a paper input tray at the back, a PictBridge port in front, and a small display screen that takes centre stage in the control panel. The controls are simplified for one-touch functions, but can be quite overwhelming for first-time users because of the way the buttons are arranged. The Lexmark P4330 connects to a PC via high-speed USB 2.0 and can be integrated into a wired or wireless network. The Lexmark P-4330 supports a variety of media types ranging from coated paper to envelopes, iron-on transfers, photo paper, and transparencies. It can print borderless on a variety of media, too. The 4 built-in memory card readers support different types of memory cards like Sony memory stick, xD picture card, and SD cards. 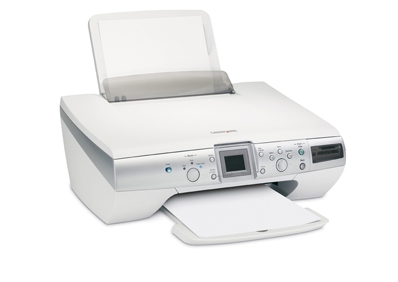 The Lexmark P4330 printer is a quiet machine and offers compatibility with PictBridge certified digital cameras. The black ink cartridge does not come standard in the 6-ink cartridge system, so the Lexmark P4330 may not produce the best text documents for professional use. This ink system also tends to be expensive to run. The Lexmark P4330 is not a reliable copier because of poor speeds at up to 3cpm in monochrome (normal mode) and 2cpm in colour. Users need to print an index page if they want to preview images from a memory card, which means ink and paper are wasted.